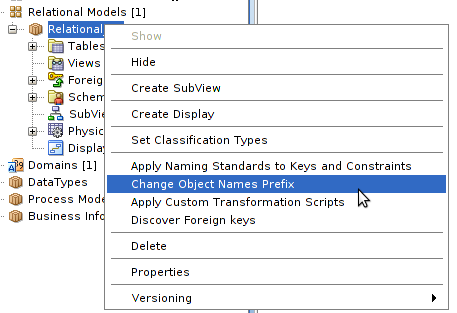 Yesterday, I showed how the new Foreign Key discovery works on a subset of dba views. The only catch was that the end result had T_DBA_ prefixes for the names. It's really easy to change that. Once you import the views and convert them to tables, delete the views. 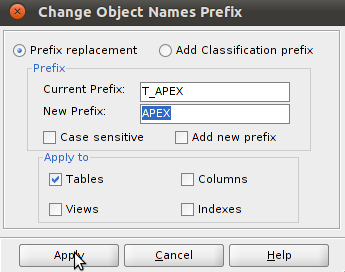 What you are left with is a bunch of tables prefixed with T_ . 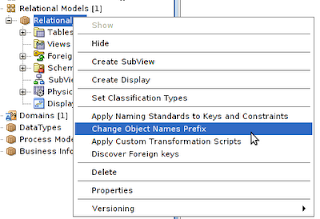 Now right click on the relational model in the tree and choose Change Object Names Prefix. This is a simple dialog, much like a search and replace. Enter the old, the new, and what object types it applies to and everything is back to the base names you'd expect in a diagram. The end result is a model of all the APEX_ views for 4.0.